Sell more of your wine yourself. You’ve always had to rely on others. Now you don’t need to. No one can sell your wine better than you and if you could sell 100% of your wine yourself, you would. But mostly you have no choice but to forfeit customers to intermediaries. We’ve made it so those customers can be your customers. WithWine gives you the power to sell more of your wine directly to those who are inclined to want it. There are many people who love your wine and want to buy more of it. But they too easily forget all the details or get confused by Varieties and vintages when they get to your website. We’ve changed the game. WithWine makes it easy for customers to buy your wines when they’re in the moment, enjoying your wine. Word of mouth is the cheapest and most effective marketing there is. But its benefits can be slow. We’ve made them instant. 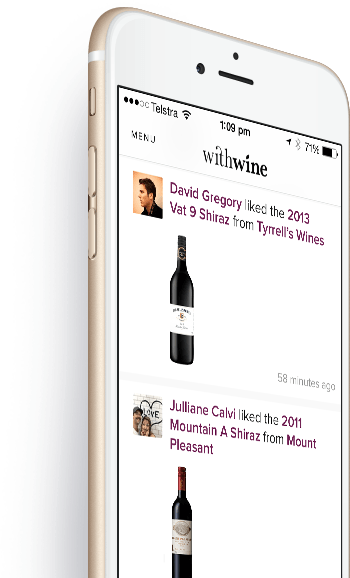 WithWine lets you benefit from your loyal customers by making it easy for them to instantly suggest your wine to their friends.